Don’t You Put That Evil On Us! by Seriously Star.In Clueless Mommy, Flashback Friday, Our Georgia Peach.2 Comments on Don’t You Put That Evil On Us! Respond via email if you would be sending a treat for the class. I responded to GP’s teacher indicating that I would send some brownies bites (my contribution in ensuring the kids went home with the right amount of sugar). Now, before you judge me…I have been VERY good with sending wholesome snacks for celebrations and parties. I thought, a couple of brownies won’t hurt, right? I pulled out some old Valentine’s Day cards I had lying around the house, signed them with GP’s government name and put them in her bag for school. Simple enough for a class of 7 two year-olds, right? Oh, Clueless Mommy, when will you learn?? 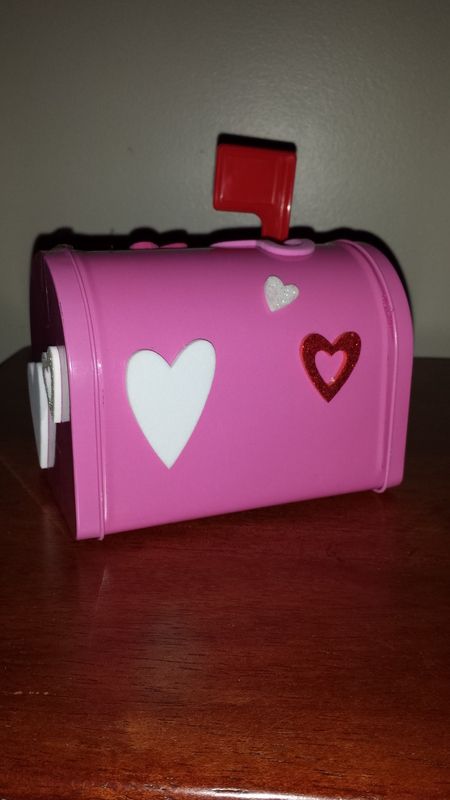 Valentine’s Day mailbox filled with evil candy from one of GP’s friends. When I walked into GP’s classroom to pick her up I was horrified to see ALL the cute gifts (she even got a book) and treats she had gotten from her classmates! They wouldn’t even all fit in her book bag. All I sent were cheesy Sports Themed cards, which aren’t exactly a reflection of her current interests or activities. Boo! She loves ballet, Doc McStuffins and Bubble Guppies. But the absolute best part of the day was this conversation with GP’s Teacher. Teacher: You guys must not give GP donuts? Me: No, it is a pretty rare occasion if she has one. Why? What happened? Teacher: Well, one of the Parents brought in some Munchkins for our party. She ate 3 of them right away so, we had to cut her off. We cleaned her face and clothes, she had powdered sugar all over. I turned to look at GP, she and the other girls were running around in a circle out of control. I guess the other Mom thought, a couple of donuts won’t hurt, right? I felt like Ricky Bobby. Ha! Is anything simple anymore, even Valentine parties? I remember being shocked a couple years ago at my preschooler’s Valentine’s Day haul–a bagful of candy to rival Halloween. Not having celebrated Valentine’s Day in a classroom since the previous millennium, I had assumed that those flimsy, tiny cards (sans candy) were still The Thing. (I had noticed they no longer came in envelopes, but whatever.) Go me. Fortunately his friends were too young to notice whose mom had cheaped out . . . I know, luckily we were in the same boat. And I didn’t even notice they came without envelopes! I just thought I was ahead of the game since I didn’t have to run around trying to pick some out. Oops! Thanks for visiting the blog.